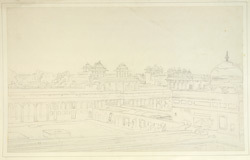 The palace at Allahabad, in modern-day Uttar Pradesh, is located within the Mughal fort. Located on the confluence of the Ganges and Jumna rivers, the fort was built by the Mughal emperor Akbar (r. 1556-1605), from 1583 onwards. The 'zenana' or harem appartments take the form of a 'baradari', a pillared trabeate pavilion comprising a series of deep verandahs, set around a central interior courtyard. The sixty-four pillars are arranged in pairs with groups of four at the corners of the building. There are decorative domed kiosks along the parapet.